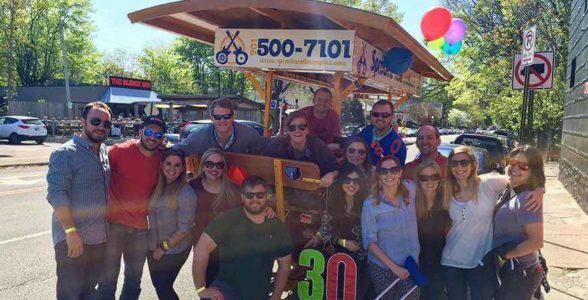 Hop on one of the best party bike tours in Memphis! 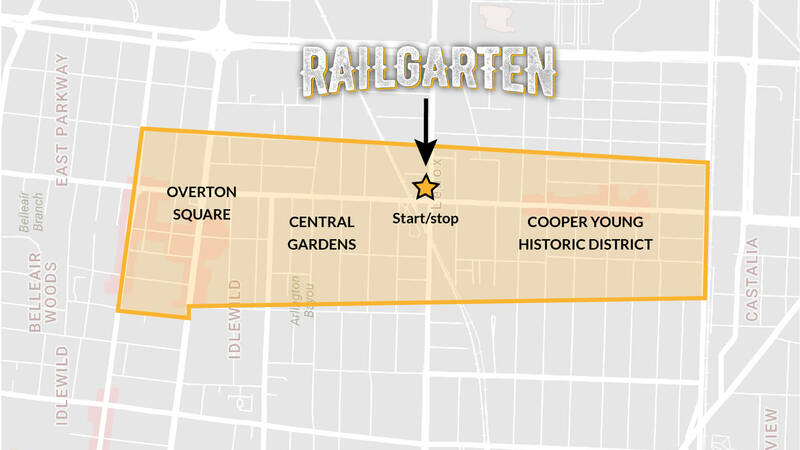 Begin and end this 2-hour tour at Railgarten. 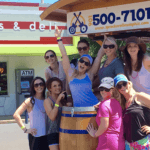 Pedal our pub crawl beer bikes through Overton Square and Cooper Young in Midtown Memphis and bounce in a few bars along the way. Check out why the locals LOVE Midtown. 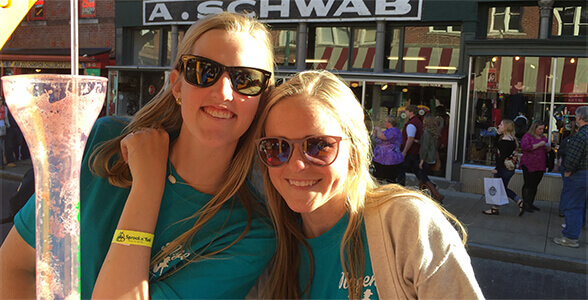 Pop in Slider Inn, Local on the Square or Young Avenue Deli for a glimpse of nightlife in the heart of the Bluff City! Hit up Zebra Lounge for some late night piano action or skip on over to Cafe Ole to enjoy a half price Margarita. 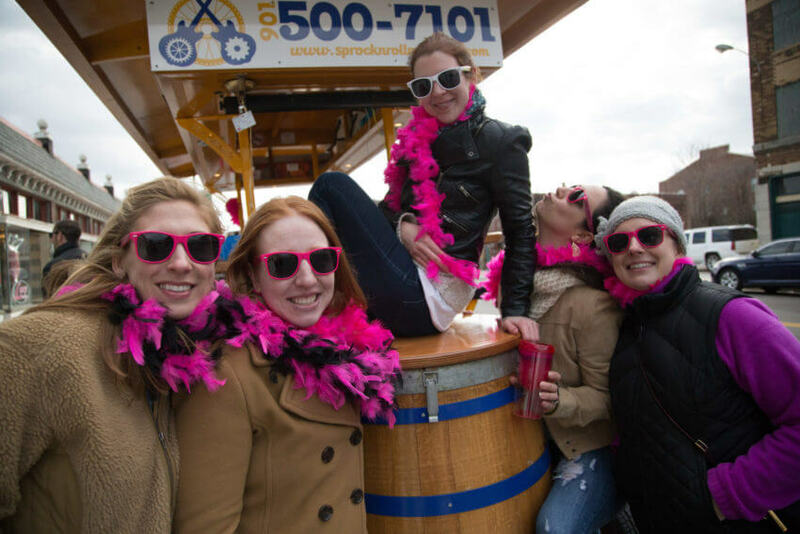 Whatever your poison, you are sure to find it on our Midtown party bike tours! Still have questions? check out our FAQ page! Pricing varies by season. Click the Book Private button below for most up to date pricing. This option is for smaller groups that don’t meet the 6-person minimum to pair up with other smaller groups. Such a unique & fun night out with my girlfriends!!!! I’m from New Orleans & would LOVE this concept in the French Quarter!! Our group had a blast! The driver was awesome, and everyone on our bike loved it! I‘d definitely recommend this for a team-building activity, or just a group of friends who want to have a good time. So much fun! Ashley and Collin helped organize our two-bike company event. They were extremely helpful and very quick to respond. And as our bike guides, their enthusiasm kept us pedaling! Thank you for hosting our super fun Counterparty!! 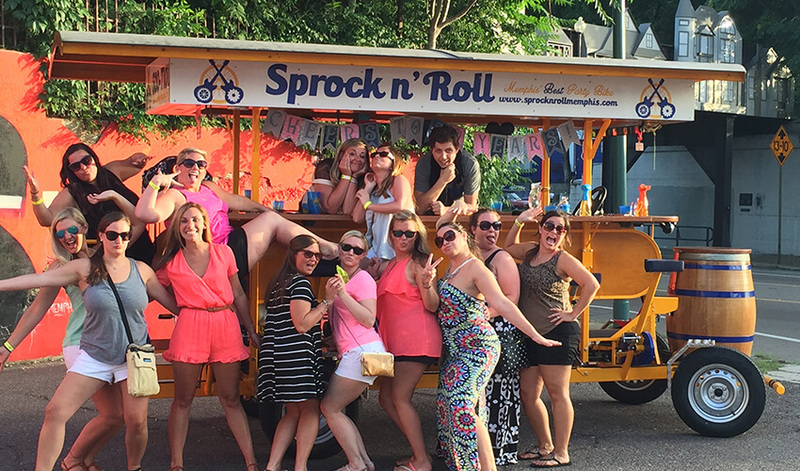 Sprock n roll is the best party bike in Memphis, hands down. Better drivers, better routes, and a longer tour time all make it the number one choice for party bikes. I have been on 3 sprock n roll tours so far this year and each one has been so much fun! We are already planning our next tour for my birthday. It was my big 6-0 so my family arranged an outing on the party bike. What an incredible adventure! Our driver/tour guide, Steve, was awesome. I loved that we stopped at several different bars that otherwise we wouldn’t have even known about. Having a designated dj and bartender made the experience even more fun. We were pedaling, drinking, and singing at the top of our lungs. Of the people on the sidewalks watching us roll by, some were merely amused but most were laughing, waving, and shouting encouragement. Can’t wait to ride again!! My friend and I were weary of participating, but we have NO regrets! It was totally affordable and we had an absolute blast. Our driver Mark was incredible and completely engaging. Their selection of tours throughout Memphis were abundant and really cater to everyone. 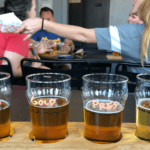 Whether you’re here on business and need something fun to do for a weekend or you have a large group for a birthday/bachelor/bachelorette party-this is a MUST! Also please keep in mind you are pedaling for the majority of 2 hours….you will sweat….and it’s ok! My friends and I came to Memphis for my birthday. Our Sprock N Roll Adventure did not disappoint. We had a blast!!! We did the Mix N Mingle since we only had a party of 5. It was fun to meet new people. Our guide, Lee, was phenomenal. He was kind, funny, and professional our entire experience. Definitely recommend this biking adventure for a good time! Ever been to a Male Baby Shower? I decided to have a Baby Shower for my son….and chose Sprock-n-Roll because it sounded fun. It sounded different. It was an absolute BLAST! Our driver was a good driver (most important), informative, helpful and most of all FUN to work with. It’s cool to get 15-16 friends in one moving spot and stop at local taverns along the way. Best money I’ve ever spent and I’ll do it again. We booked the Sprock N Roll in downtown Memphis for friends visiting in town for a fun little tour/bar crawl. There were 5 of us and we were on the bike with two other groups, who were awesome. Lee made the ride so much fun with his enthusiasm and sense of humor! It was really cool to be able to see the city while also having some fun. We hung out with the people we met on the bike for the rest of the night and it really made the ride that much better! New friends and fun times were had by all. I literally had a blast! It was an amazing experience that everyone should do at least once if they live in Memphis or surrounding areas. Our driver was the BEST we had so much fun with her! I’m planning to do it again in October for my birthday and I literally can’t wait!!! !